Celebrating Bayshore Volunteers: Say "Hi and Thank you" to a BVA Volunteer Today! Bayshore Village is a wonderful place to live because of the spirit of community among the residents. Primary among our volunteers are the members who serve on our Board of Directors. Many more of our neighbours also give their time as volunteers to keep Bayshore beautiful and to enhance the amenities that we cherish. 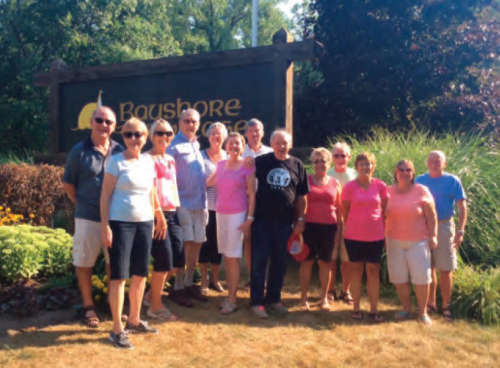 In this issue of The Bayshore Banner, we feature the Bayshore volunteers. The project was initiated by Ted and Betty Gryzick, who pulled together the people who are pictured on these pages. They counted 58 volunteers who work on our village gardens alone, and as you will see, there are many more ways to help enhance village life. Please consider being a volunteer in the coming year. Left to right: Rich Bishop, Lauree Bishop (Coordinator), Marilyn Richardson, Paul Ash, Peggy Powell, Laureen Ash, Doug Pollard, Ralph Moore, Sandra Cherry, Simpson Cherry, Marielle Montemurro, Jeanette Cherry, Scot Cherry. Missing from the picture: Sally McPherson, Sharon Miller, Wayne Richardson, Lynda Tofflemire.